As the Utah Legislature considered whether to adopt hate-crimes legislation in the 1990s, opposition to protections for gay, lesbian, bisexual and transgender people led lawmakers to avoid naming groups covered by the bill. The statute they ultimately passed has never resulted in a conviction that has held up. Now, as the Legislature prepares to consider a fourth proposal in recent years aiming to give that law more teeth, legislators and advocates say that the same objections that hampered the original law a quarter century ago remain a sticking point. Weiler, who said he plans to support the measure this year after voting against it in 2016, speculates that continuing controversy is because the Legislature passed a law in 2015 to enact Utah’s first statewide nondiscrimination protections for the gay and transgender community while also providing safeguards for religious liberty. That compromise legislation on housing and employment discrimination came after seven years of debate and received the blessing of both The Church of Jesus Christ of Latter-day Saints and the LGBT community — and it may be as far as the Legislature wants to go for now, Weiler said. (Rick Egan | The Salt Lake Tribune) Sen. Todd Weiler makes a comment about the inland port, in the senate, during a special session at the Utah State Capitol, Wednesday, July 18, 2018. Equality Utah Executive Director Troy Williams agreed that the LGBT provision has been holding up passage of the bill. But he argued specifically that it’s the church’s position on those protections that’s acting as a roadblock. The church has long been perceived to be entangled in hate-crimes legislation. When his proposal on the issue failed in 2016, for example, former Sen. Steve Urquhart, R-St. George, said opposition from the church had “snuffed out” the bill. Church officials made no public comment on the issue in 2017 or 2018, but Sen. Daniel Thatcher’s bill died in both legislative sessions without a hearing, and he has argued that the faith’s neutrality was perceived by some lawmakers as objection. “Perhaps the perception is that the church is more involved than that,” he said. Stephens declined to offer a stance on the LGBT provisions or on this year’s bill, noting that its language has not yet been distributed publicly. Salt Lake County District Attorney Sim Gill has often criticized the state’s current hate-crimes statute — under which only misdemeanor assaults can be enhanced as hate crimes — for lacking teeth and falling short of protecting several classes of people. Frank Pignanelli, a lobbyist and former lawmaker who sponsored the bill in the 1990s, also expressed disappointment in the law, which he said hasn’t served its original intent. At that time, opponents also pushed back on some of the bill’s specific protections. In a 1992 Deseret News editorial, the paper came out in favor of passing hate-crimes legislation, arguing that opposition to it was based on the “wrong reasons." Today, LGBT people are twice as likely to be the targets of hate crimes as African-Americans, and the rate of hate crimes against them has surpassed that of crimes against Jews, according to a 2016 New York Times analysis of FBI data. In Utah, a mob chased a group of gay people after the Utah Pride Festival last summer while yelling homophobic chants and slurs. And, in 2015, two gay men were attacked after exchanging a good-night hug in Salt Lake City. Their assailants appeared out of the darkness, calling them “f------," a gay slur, according to one of the victims. With this history in mind, Williams said it’s important that legislation ensures the LGBT community is included in hate-crime protections. 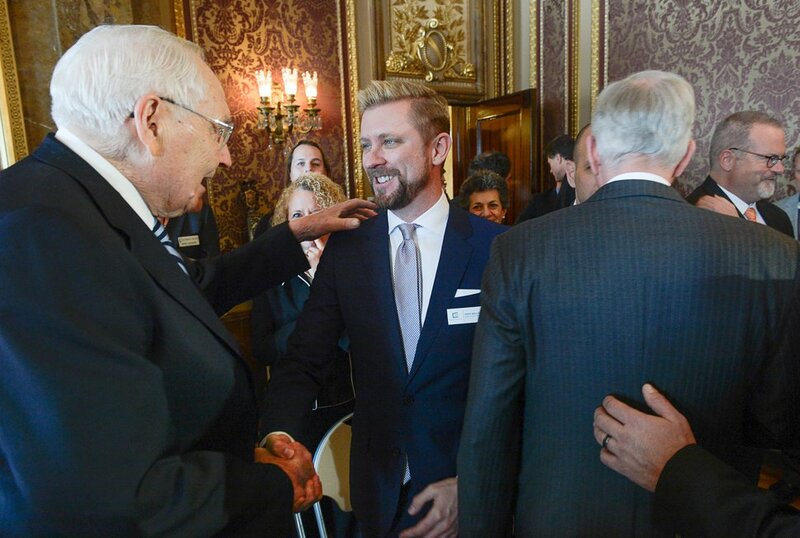 Francisco Kjolseth | The Salt Lake Tribune L. Tom Perry, second in line for the LDS Church's presidency, left, shakes hands with Executive Director of Equality Utah Troy Williams following a press conference at the Utah Capitol to announce the nondiscrimination bill SB296. Thatcher’s bill, which has not yet been filed, would allow judges to increase the penalties for a charged crime if a defendant is convicted of targeting someone based on ancestry, disability, ethnicity, gender identity, national origin, race, religion or sexual orientation. Someone must first be convicted of a crime before additional penalties would apply. Pignanelli said he supports efforts that would give prosecutors and law enforcement officials the tools they need to curb crimes targeting a person based on his or her characteristics — but he expressed frustration that the conversation is ongoing. Utah’s hate-crimes law gained national attention in November, when a man who was charged with beating Jose Lopez, a Latino, and his son outside their Salt Lake City tire shop while yelling about how he wanted to kill a Mexican did not face any enhancements for a hate crime. Thatcher said the media attention highlighted deficiencies in the current law that could help make his case to the Legislature for amendments in the coming session and demonstrated that the issue of hate crimes extends beyond just the LGBT community. He also speculated that the inauguration of a number of newly elected lawmakers coming into the Legislature may help his cause. “We have a better chance this year than we’ve had in years past," he said. “Part of it is the high-profile Lopez case happening when it did. I think we’re going to have new people coming on board this time." Weiler said the proposed changes to the hate-crimes bill have come a long way since Urquhart’s proposal in 2016 and will successfully punish people not for what they think but for whom they select as their victims. And while he sees good arguments on both sides, he feels a moral imperative to address the issue. Incoming Senate President Stuart Adams, R-Layton, said he is unsure how the majority of lawmakers view Thatcher’s bill but raised concerns that the protections for groups are “too specific” and should be broadened. An overwhelming majority of states have hate-crime laws, but they vary, to some degree. Most designate race, religion and national origin as motivations, but 13 states do not include sexual orientation and 33 do not include gender identity, according to The Center for Public Integrity. Moving into the legislative session, which begins Jan. 28, Thatcher said that even if protections for the LGBT community doom his bill, he won’t be backing down. If you don’t enumerate groups, he said, you can’t offer them protection. “In my opinion, it would be cruel and immoral to pass a law that does not apply to all Utahns."